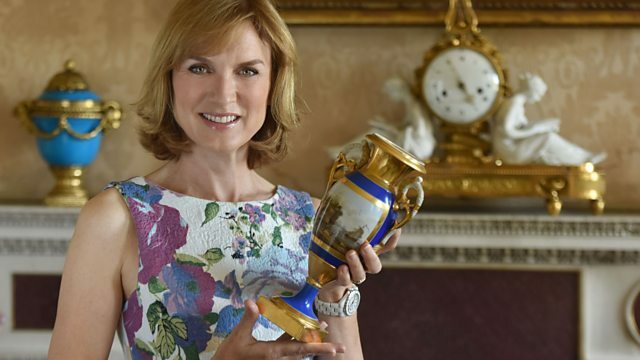 Antiques Roadshow boards the Flying Scotsman for a special edition that celebrates the golden age of travel. Browse content similar to Golden Age of Travel Special. Check below for episodes and series from the same categories and more! Tonight on the Antiques Roadshow we are doing something rather special. We're about to board a great icon of the age of steam. It evokes strong passions, reducing sensible people to quivering jelly. Because any minute, she's going to be coming round that corner. and we're about to get our own very special ride. Here she comes. Look at that! The sound, the smell - there's nothing like it. Welcome to the golden age of travel on the Flying Scotsman. never before have we held a show on anything like a moving train. And its first outings in 2016 caused world headlines. for this romantic relic of the steam age. Its launch attracted the kind of attention normally reserved for A-list celebrities. People flocked to see the Flying Scotsman as it sped through towns and the countryside. with their vintage travel treasures. that we'd be celebrating the golden age of travel in a special programme. are now boarding the Flying Scotsman in our own exclusive carriage. Later, we'll be meeting an obsessive vintage airline uniform collector. How many of these have you got at home? At the last count, 133. The pilot who barrel-rolled Concorde. that gets expert Paul Atterbury all of a quiver. It's like holding the relic of a true saint. to join us, each passionate about bygone eras of travel. you mad train enthusiast, you? -what more could one want? John, what about you, are you enjoying it? I've never been on it before and it is just every boyhood dream. Well, anything to do with steam. You know, the smell of it, the excitement. The sound. All those smuts blowing in your face. And, I suppose, anything that can turn the key on the golden age of travel. speeding through some of Britain's most breathtaking scenery, to York. And what better way to start than with a story about the Flying Scotsman itself? Wonderful looking out the window and seeing all this steam. In 1923, in Doncaster, the Flying Scotsman was built. to travel between London and Edinburgh. travelling nearly 400 miles in seven and a half hours. the great-grandsons of one of the drivers on that record-breaking run. and to tell us their story. was the idea of running nonstop between London and Scotland. Now, Thomas Blades was one of the drivers on that historic run. And he was your great-grandfather. Yes, yeah. And it's such an honour today to be on that very same train. I've been doing research into my great-grandfather and found lots of information about him. Found this picture at a local railway museum. the run from King's Cross to Edinburgh. And took the train all the way to Edinburgh. he travelled the first part of the journey in the carriage. -swapped over with driver Pibworth, who then went back. And the train never slowed. -They swapped their hands off the regulator. -You can see it happening, can't you? which is a standard LNER locomotiveman's pocket book. But of course this is his, isn't it? and the various notes in the back about the record-breaking run. There it is, that he did that run. And do you think he had this with him at the time? and all the maintenance of the engine, et cetera. I'm sure by then he didn't need to be told those things. But nonetheless, you would always carry your pocket book in case something went wrong. Yeah. To tell you if you need to fix something. Not only have you got the locomotive, you've got the book. That he carried with him. He's almost with us, isn't he? I think it's a wonderful story. And it's a real insight to me into how skilful those men were. They were a great race of drivers. Celebrities of the day as well. Yeah, they were superstars of the day and there was lots written about them. in terms of that speed and beating records. Now, actually, I've got a piece of film that relates very much to this. Sadly, it's not Thomas Blades, but it could have been. It shows how popular the locomotive was. It's been popular all its life. There are always crowds watching the departure. -Have you seen it before? -Haven't seen this one before, no. Now, we're supposed to do values. A tatty old book - what's it worth? I mean, you'd be lucky to get £5 for it. -Absolutely, but it would never be sold. It'll always stay in the family. And carry on the research, heaven knows what you might find next. 'Overhearing Paul's conversation has prompted me to change into regulation railway gear. that visitors to the Roadshow have shared with us from the age of steam travel. Let's begin by remembering a great find that excited Hilary Kay. One of the earliest toy trains in the programme's history. something that is THE best of its kind. It is exquisite metalworking at its very best. with occasional little pieces of brass, around 1845, 1850. And the more you look at it, the more fabulous it is. then coming back you've got the three classes of coach. Second class, just with a roof. You hope it's a day like this. As it always is in Scotland! In there, all those fabulous little people. It looks like a sort of outing from Jane Austen. There they all are off on their picnic or whatever. between £25,000 and £35,000 at auction. And for insurance, certainly £50,000. Paul Atterbury was in his element. but he also discovered a rare and early railway sign found in a garden. You know, it's really exciting for me to see this map sign. and how it developed early in its history. Now, let's look at the story briefly it tells. This is the map of the Great Western network, and its connections. -But it's really about going to Ireland, isn't it? By the new Fishguard route. -Which is from there to Rosslare. And this was about the Great Western competing with its main rivals. but that was the London and North Western. Can we date it, do you think, from that? The route opened in August 1906. So it has to be after that date? But they're still calling it new, so this is 1906-1908. It's also in quite good condition. If I saw that for sale, I'd expect quite a lot for it. But you got it in your garden. 30 years sat in the garden. is from Walthamstow Town Hall. for one of our visitors. and this is a ticket for the opening of the railway. Dated on the bottom 30th of May 1839.
for the sort of drive and the keenness to supply coal to Leicester. So you effectively paid nothing for this, did you? -Yeah, yeah, I did, yeah. So if I were to say to you £1,000, what would you say? Railway memorabilia is really hotly collected. You are... You're having a mumble, in't ya? You're winding me up, in't ya? I don't think he is, mate! Not a shadow of a doubt, my friend. Later, we'll return to more stories from the steam era. we move from one golden age of travel to another, to flight. travelling between London and Australia. whose father once flew these exotic trips. if you like, of commercial air travel. Now, what's your relationship with this group of objects? and that stayed with him all his life, until he died in his 80s. best known for its use of the Empire flying boats. and then a little later, Australia and into New Zealand as well. Exactly. And it was a glamorous time. everybody dressed for dinner, and he was part of the social side of the life. mending a propeller or something. -A bit like this, in fact. that it was a stopping service. then you would board the flying boat the next day and off you'd go. Well, this is the flying boat in action. And let's just watch what your father would have had to have done as the captain. It's a vast craft. It comes down very smoothly. I suppose there must have been some choppy landings. One forgets, of course, you had to tie up to something. Here comes the tender to take all the glamorous folks to the shore. And, gosh, where are we? It looked like the gateway to India, didn't it? they would have gone into overnight. the golden age of travel. the oxygen mask, I mean, those have a tangible value. I'd put those cumulatively at about £1,500. -to you and your family. Don't we all wish we could still do that journey? The British R101 hoped to herald a new age of luxury travel. tragically killing most passengers on board. to hear her poignant tale. Here we are, stationary, unusually on this voyage. This is one means of transport. is a completely different means of transport. The British R101, which were a vision of travel for the future. came to nothing, because of a series of disasters. that great disaster on its maiden voyage. But I know you have a very particular connection to it. Lieutenant Commander Noel Grabowsky-Atherstone, known as Grabby. What was his particular role? he was meticulous in observing the performance of the airship. So, he was a key figure. -And therefore this journal is dynamite. -It's the story of the development of the R101. And this sense of luxury, do you know what it was like? a sort of flying Titanic. She was 777 feet long, twice the length of a football pitch. And she had two decks. It was an extraordinary luxury of a scale that we can't imagine, really. the R101 sets off for India. -Well, she ran into stormy and very windy weather. In fact, my grandfather had been on watch until 2am. Nine minutes later, she crashed. The reason for the fire was calcium flares. And they ignite against water. Otherwise, she could perhaps have been salvaged. So we've got some footage here, which I gather you found. Yes, I found it in a rusty old biscuit tin hidden in a trunk. Well, let's see what it tells us. I think what we see first of all is how big she was. People look like ants on the ground. I mean, she was vast, enormous. So this is a sort of brief story of the ship, isn't it? -Because there is the crash. died away in the fields of northern France. It certainly did - very sad, very sudden. What was the impact on your family? My gran, I don't really know how she coped, and there was a state funeral. and at 2.09am he let out an unearthly howl. but she knew then something terrible had happened. So, of course, the diary stops at a crucial point. And it's very interesting, I'll read the last entry. "very largely depends on what sort of show we put up. "will figure rather conspicuously in our flight. "Let's hope for good luck and do our best!" Curious that he left it behind. And did he leave this behind, then, for his evidence? It's quite possible, because every single thing is documented. but it really changes the whole story of the R101. This is a very valuable document. they would pay thousands of pounds to own this. is crucial, and actually goes beyond a family. You know, this is information of national significance. Well, we'll perhaps have to look at getting it published, then. without including that iconic jet Concorde. in Gloucestershire, we had to see for ourselves. from trolleys to teacups, it takes up the whole of his conservatory. We invited him on board to tell his story to John Foster. I can see you're a bit of a sort of collecting Concorde nut. Well, it's been part of our lives for nearly 50 years. -1969, my wife and I were nearly killed in a car crash. We were in Gloucester Hospital for a long time. And we were married in hospital. and it was a bit of a sign. It was something that was very special. Well, we've been married 47 years in a fortnight's time. And still going strong. And Concorde is just something very special. It touches the heart, I think, of everybody that flies in it and knows it. it hadn't actually had a commercial flight then. Not at all. They were purely in trials at that time. I think, was the first commercial flight. -And you've obviously been on it a few times. just three weeks before she finally finished commercial flying. People would say, what was it like to fly? It was like nothing else in this world. but you had wonderful service. Amazing drinks, food and everything else. travelling as fast as a bullet from a gun. you could say an obsession, is that fair to say? Yes, it is an obsession, to be perfectly honest, yes. Is your wife as obsessed as you? No, she puts up with it. When I went on it, you got... my souvenir was a silver photograph frame. And you've got some amazing things. when you sat on the plane. They went to town on what they provided. -There are some things which are most sought after. And it goes down. Where a food container like you've got here comes in at £200, £300, £400. Whether these, £30, £40, £50, sort of per bit. -Because people still love Concorde. Thank you very much indeed. Cheers. Captain Walpole, one of the first pilots of Concorde. to be at the forefront of supersonic travel. It was fantastic, it really was. in one single giant stride. There are some extraordinary statistics associated with Concorde. I mean, not least that you yourself have flown four million miles. Yeah, four million miles, 200 times round the Earth effectively, yes. Yes. 804 crossings of the North Atlantic. What was it like to fly at that speed? because you were flying up at 60,000 feet. You could control the aircraft with the fingertips of one hand. you had a horizon of 250,000 square miles. was a highly complex aeroplane. There's something rather surreal talking about it with all the steam going past, you know, the contrast. Between what we're talking and what we're on. one of the first test pilots on Concorde French 1. He said, Brian, how about doing a barrel roll in the Concorde? and straight and level again. He said, "Brian, I've wound it up, you can unwind it for me." When I got back to London and told people, they were aghast. Because, firstly, they didn't know it could be done. so it was perfectly safe and adequate. Would you say that was the golden era of travel for you? Not for me but for aviation, the world. It was so different, it became an icon in its own right. It's been a pleasure to talk to you about it. -Thank you very much, Captain Walpole. The Antiques Roadshow archive contains many tales from bygone eras of air travel. began in the early 20th century. So, you're direct descendants of this great man? and he was an American citizen when he actually flew British Army Aeroplane No 1. £50 was given from the War Office. And he achieved the first flight in this country. for the first powered flight in Great Britain. silver model of an aircraft. and it was presented to Cody at the Royal Aero Club in 1912.
and probably the plane that killed him in the end. and 50,000 people lined the funeral procession. 50,000? That's how important he was. He was a very important person. Well, now, let's think about value. that your great-grandfather was a pioneer of aviation? -It gives us a lot of pride. -Gives us a big buzz. to test the aerodynamics of planes, including Concorde. with rare design prototypes of the supersonic jet. from a triangle to a Gothic shape to an ogee. and all different wing shapes. What sort of age are we talking about, early '60s for something like that? Yes. These were just in the early '60s. It's a wonderful English and French engineering effort, fantastic. Nothing has been bettered yet. -No, what a shame it's no longer with us. How on earth can you put a value on these things? I can't begin to value them. You just can't put a value on. that looks straight out of a Boy's Own story. for a fast rail service powered by a propeller. I've come across references to the George Bennie railplane. -suspended from an overhead track. It was a cross between an aeroplane and a train. Yes. We're talking 1929, I think. That's when the test track was built. which looks like a deluxe passenger car of any transport system. was kitted out in Pullman style to create a maximum effect. This was really the peak of exploring new ideas. -Unfortunately it hit the Depression. he failed to get backers and could not get it built. Had he succeeded, it could have been the answer to the future. over all the mainline tracks. How the world would have been different. The country would have looked very different. as a matter of course. These are obviously very collectable. -We're looking at £5,000 per document. -But that's neither here nor there. -The most important thing is how it would have changed our lives. whose large collections make perfect platform displays. Hilary Kay has ever met. he's left 125 of them at home. I'm surrounded by what I can only describe as style in the aisle. showing a TWA stewardess wearing exactly what Georgia's wearing. So, tell me, why have you got four or five uniforms? with a slogan which was "run by flyers, not by businessmen". So how many of these have you got at home? The last count, 133 uniforms from various airlines. Obviously you're passionate about this. so I collect anything I can find. Even the images. The advertisements, the photographs. And this, I think, sort of epitomises that early artwork. This is, what, from 1949? And you can see it was absolutely the golden age of commercial travel. -That's right - the flying bit was the adventure. and in it, it says, "Make the most of every thrilling travel moment,"
which, of course, involves, "How to pack a man's suitcase." -What every woman should know. it was about the most glamorous thing you could imagine doing. It was the ultimate aim in life. -Which brings me onto the next point. I'm going to ask you what's the most expensive one that you have here. The most expensive here has got to be the 1944 cutout uniform. To find one complete is pretty rare and probably about £1,000. This is your daughter, Georgia, I should say. And, Georgia, you do look fantastic in it. Does Georgia share your passion? She shares a passion for fashion. -She puts up with modelling for me. £1,000 is absolutely what I've been seeing them go for. then you're up in that price range. Because it's a passion shared by so many. and '60s. Thanks very much. but could it be the rarest find of the day? This is the original smokebox numberplate. -The one you can see up there is a copy. -It is the real thing. -It's like holding the relic of a true saint. So, how have you got it? about 20 years ago now. and he got it from the original owner. Right, there's no doubt it's come off that locomotive? had a new numbering system. -And 4472, as she was, became 60103. -And the plate went on the front. -And at some point it came off again. It did. When it was withdrawn from British Railways in 1963. -You're a very lucky man. -I'm very proud to have it. and the most famous locomotive in the world. And there can't be many people who can say, "I've got a bit of that." I've got a bit of Flying Scotsman. And a very important bit. -And a very important bit. I mean, I can put a value on it. -is going to be £2,000, £3,000, £4,000. -But this is the Flying Scotsman. -This is the Flying Scotsman. Probably between £10,000 and £25,000. I think that would be a safe bet. So we're holding a piece of scrap iron which could be worth £20,000. Perhaps I should just get up and put it back? -I'll give it to you. No, I won't. Thank you. than the busy platform at Carlisle station? of Colin's collection of popular masterpieces. like a railway poster from the '20s and '30s. -What do they mean to you? -It's just the colour, the image, the style. as the pleasure one gets from looking at them. Iconic structure, known all around the world. And just the colours just caught my attention. because that is by far my favourite. One, I love the Forth Bridge, two, it's done by Frank Mason. with the blue water, so stylistically brilliant. not from the '20s and '30s. which is why he's so successful at transferring that to rail. Ronald Gray, another great artist. But sort of a more typical scene. certainly not as architecturally brilliant as this one. But all the same, just unbelievably pleasing. So, where would you buy them? I bought these at auction in New York. didn't even know he had them. I would say sort of £1,000 to £1,500, that sort of money. The Ready For The 12th, it's a great image. It's big, so I would put that one at sort of £4,000 to £6,000. And...do you mind me asking what you paid for this one? I paid £1,100 for that. That's the one I would love, and I think that's close to £2,000. And it's just great to see, so thank you. in this Antiques Roadshow special. relating to different eras from the golden age of travel. five decades working on board ships like the QE2 and Queen Mary. Sounds glamorous? He tells us it was anything but. and good-looking chap in here, can't think who he is. almost like a bus running on a timetable. And what's your relationship with all this? after 16 weeks training on deck, we joined the Queen Elizabeth. we were asked then that they needed volunteers. We were always told never to volunteer. We asked what it was. Firemen. Well, we all thought a fireman was a fireman like with a hose. Did we get a shock when we ended up in the engine room! everyone had to muck in. -Was it all of that? -Yes, the heat, noise, was really unreal. it runs out of you. Each time you went up for a break you had to take salt tablets. -every four hours while we were down there. And when you came out, the sweat through your gear would turn white. -It was just caked on? At this point, I've got something you might find interesting. Yes, that would be the... Queen Mary, is it? Now, she's going at a heck of a lick. How fast would she be going? She'd be going at 27 knots. You and your fellow firemen were responsible for that. That's a great shot, I can remember that coming in, like. Amazing. Did you get to meet the passengers at all? We never got to meet passengers. We weren't allowed to meet the passengers unless they spoke to us. If they spoke to us, that was OK. But we weren't allowed to speak to them, they called it broaching cargo. Say that again. "Broaching cargo"? was talking to a passenger, unless they spoke to you. -It could be a day's pay, like. -a sort of general deckhand. or known as... Senior rates used to call us electrical deckhands. You get a shock if you see them work. That's funny! So how long was your career? -And when did you retire? a different view of the golden age of travel. they are sought-after by collectors. I'm not going to put a fortune on them. I would have said perhaps the three together, perhaps £150. that they've got something from those wonderful cruising days. -They're a great piece of memorabilia for you. -Smashing. Nice talking to you. for the fastest transatlantic crossing in 1907.
when she was sunk by a German submarine in 1915.
who's brought a rare relic from the Lusitania. at the bottom of the sea for a while, I get really excited. I spent a lot of time in Florida as a kid diving on ships like this. Tell me about your connection with it. with ocean liners, really from a young child. and I got the bug ever since then. and this happened to be in an antique-shop window. And I just looked and thought, "I've got to have that." Now, when you say in an antique-shop window, what was it being sold as? It was sold as a porthole from RMS Lusitania. And it came from the mailroom. So specifically located on the port side of the ship. And it was recovered back in 1982.
they started removing bits from the Lusitania. when you have this in front of you? of the grand era of luxury and liner travel. When you think of the Lusitania, it has got a fascinating history. that if they sailed on the Lusitania, it would be a target. -No-one believed it, cos they didn't want to drag the US into the war. -They didn't think that would be a sensible thing to do. and a huge loss of American life. Yeah, a lot of children, innocent children, were on board as well. Babes in arms, so, yeah, a tragedy that affected everybody. -"the last person was to actually look through that on the day." I mean, that is great. makes the whole thing come to life. the people that were killed on board - women, children. Yeah, it really...it's living, isn't it? It was a floating palace. -What a way to travel. That's when you could argue that the journey was the destination. then it was about the whole thing of enjoying that process. And so, presumably you don't have this bolted to the wall or anything? I think the wall would give way. It's pretty hefty. No, it just sits in my dining room. It definitely could not be wall-mounted. OK, so, you bought it in an antique shop. -Probably about eight, nine years ago now. ..£400, £500, maybe £600, something along those lines. Yep, sure. No, I'm pleased with that. As for me, it's just the wow factor. on previous Roadshows. Here are some of our favourites. Paul was treated to a very rare sight. that had been stripped out to refurbish office interiors. Now, of course, everybody knows the story of the Titanic. They can't not know it. is still perhaps not so well known. They were sisters, weren't they? Yes, there were three sisters. is a smoke vent from the second-class smoke room. Now, this is exactly the same as the Titanic one, isn't it? were bought at the same time so could have went into either ship. Light fittings. They're fantastic, aren't they? hanging in some grand saloon, twinkling through the cut glass. Right, so, these show your offices, in effect, do they? This is the conference room, yes. of a sort of wooden surround, carved surround. Yes, that was first class. That was what was in your first-class suites. all of this is out of the ship. So they bought, in a sense, a complete room? -Does that show the lights? and that's out of the second-class smoking area. which happened to be fitted out with the Olympic. Can I ask how much? Yes, they valued the total fittings at £40,000. You've got 28 of those? -I would think is going to be £300, £400. So, multiply that by 28. You're getting on towards your money back. ..one of the most moving pieces we've seen at the Roadshow. mourning bears, they said, to mourn the loss of life on the Titanic. And this is what you're holding. but also it's what your eyes do when they cry. -You know, this bear has got red eyes from crying. at auction, fetched just over 200,000.
on all the British Antiques Roadshows. ..well, it's a real eye-opener, and thanks so much for bringing him. brings our archive selection to a close. approaching the end of our journey. Just time for one last story. with the Flying Scotsman's nonstop record run from London to Edinburgh. ..including the end of the age of steam. I suppose I'm a very typical grown-up small boy. and I can see here...somebody was. and pieces of equipment of a driver, a driver's life. Now, is that your family? Yes, it was my grandad. He started after he left the Army in the early '50s. on steam and then through to diesel. And as a result, it's a very interesting record. It's a full catalogue of everything he did for about 40, 50 years. In the diaries, there's a couple of things that I quite like. And looking through the diaries, that's the end, isn't it? -Yes, that's the last one. -Yeah, that's the last one. So, suddenly, that world is gone. .."Started work diesel training York." -So, the world has changed. was dedicated to removing steam out of the British network. we had to build an up-to-date network. when diesels were new and exciting and modern. Let's have a look. This is a new one being launched. It's pulling out of Paddington. And...the view from the cab. There's the past going past, very literally. And look how comfortable that is. He must have sat there and thought, "This is great." And, of course, his life was radically improved. I mean, there he was in a locomotive cab. in a diesel locomotive, operating controls. It must have been wonderful for people making the transition. What was it like in the family? to what he did when he were on steam trains. -is this thing about cooking food in the cab. and then put a tin of beans on top - you could have beans on toast. But if you go back to steam, you cooked on the shovel, didn't you? -And did you do that? Yeah, me dad took me to work, we did that. What do you think was the high point of his life? -Probably when he drove the Royal train. he were so giddy when he came in. -He gave him the hat. -He gave me the hat he were given. That were his new hat for the Royal train. -So this is the Royal-train hat? cos they'd got a special cargo. And because they were careful? And they were careful, yeah. So when he gave me that hat, that were the proudest moment. Right, what's it all worth? probably worth a couple of hundred pounds. But the memories it releases, to me, are absolutely beyond price. to relive that golden age. Our guests and experts have loved it. Thanks to our visitors for bringing along their precious mementos. and the Flying Scotsman will get a well-deserved rest. From the whole team here on board, goodbye. In an ambitious first, Antiques Roadshow boards Britain's most famous steam locomotive for a special edition that celebrates the golden age of travel. Fresh from her ten-year restoration programme, the Flying Scotsman welcomes Fiona Bruce and experts, as well as visitors who bring treasured family heirlooms that each tell tales from different eras of travel's bygone days. As the locomotive thunders across Cumbria and Yorkshire, visitors on board tell experts about relatives who took part in some of the greatest moments in travel history. Family legends like the great-grandfather who drove the Flying Scotsman on its 1928 record-breaking non-stop journey from London to Scotland and the pilot who flew in the early days of luxury air travel, when flying boats delivered guests to five-star hotels around the world. Experts Paul Atterbury, Hilary Kay and John Foster excitedly examine a range of travel-related objects, including a porthole from the wreck of the ocean liner RMS Lusitania and designer cutlery used by celebrities on board Concorde. Perhaps the most enthusiastic accolade is shown for an iron bar bearing the numbers 60103 - recognised by rail enthusiasts worldwide as the original smoke box number plate for the Flying Scotsman.